Beloved for its compact foot print, this bunk bed is a necessity for your children's bedroom. The sturdy, steel frame promises stability and function to support up to 250 pounds on each bunk. Features full length guardrails and an integrated ladder that can be mounted on either end. This ideal space-saver, unlike other bunk beds, easily and safely converts into two individual twin beds. 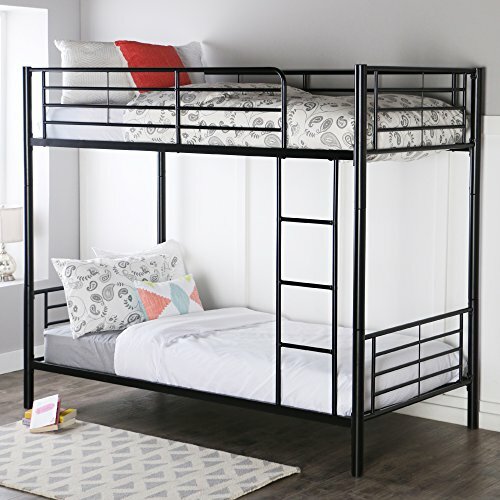 Features: Finish: Black; Material: Steel with Powder Coat Finish; Includes Supports Slats, No Box Spring Needed; Mattresses or bedding NOT included; Ladder can be attached to either end; Separates into two twin beds; Maximum recommended upper mattress thickness of 9"; Ships ready-to-assemble with step-by-step instructions. Specifications: Overall Product Dimensions: 68" H x 79" W x 42" D; Product weight: 100 lbs; Clearance Between Bunks: 44"; Each bunk supports 250 lbs; Meets Consumer Product Safety Standards (CPSS). If you have any questions about this product by Walker Edison Furniture Company, contact us by completing and submitting the form below. If you are looking for a specif part number, please include it with your message.